Ferric-chelate reductase (FRO) genes are essential for iron uptake in strategy I plants. 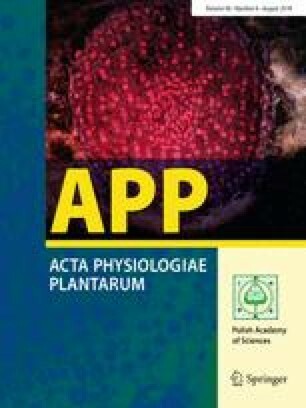 In this study, Medicago truncatula plants were grown in a greenhouse under iron-sufficient and iron-deficient conditions with inoculation of the beneficial rhizobacterium Arthrobacter agilis UMCV2. The expression of five MtFRO genes and the marker genes MtDef2.1 and MtPR1—involved in systemic resistance pathways—was quantified by RT-qPCR in plant organs. MtFRO1 and MtFRO3 were expressed in roots, and MtFRO2 was expressed in leaves, flowers, and pods. MtFRO4 was expressed in leaves and roots, and MtFRO5 was expressed in roots, stems, and leaves. A. agilis UMCV2 and iron deficiency induced the expression of all MtFRO genes and systemic defense marker genes. The defense genes exhibited expression profiles similar to those of the MtFRO genes, and strong synergistic gene induction was observed in A. agilis UMCV2-inoculated plants grown under iron-deficient conditions. Our data supported the existence of a relationship between systemic defense responses and systemic iron deficiency responses. We thank the Valencia-Macias foundation (México, Grant 2.1) and the Coordinación de la Investigación Científica UMSNH (México, Grant 2.22) for providing financial support.